The United Nations has designated January 27 as International Holocaust Remembrance Day, marking the anniversary of the liberation of Auschwitz. 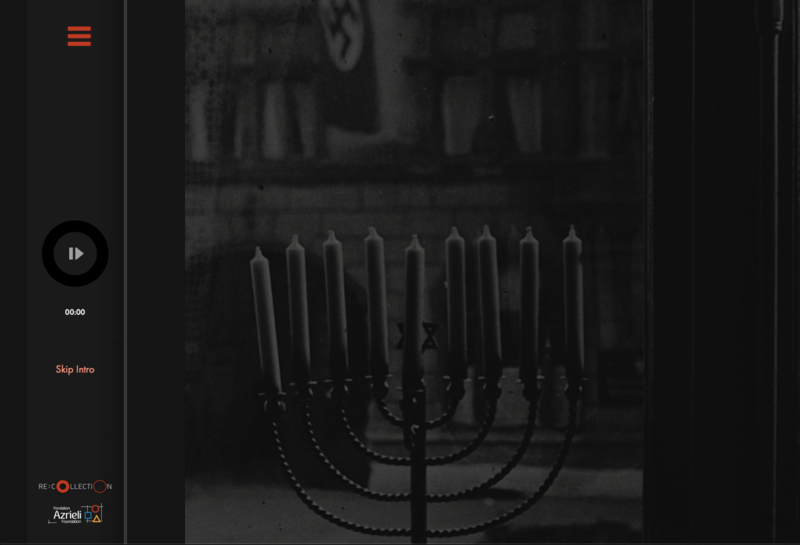 On this day, the Holocaust Survivor Memoirs Program encourages you to reflect on the history of the Holocaust with your students, and we offer this short activity as a way to introduce your students to the history of the Auschwitz concentration camp complex. Students will learn about this significant site using Re:Collection, our digital platform. Re:Collection allows students to explore the history of the Holocaust using “recollections,” which are pieces of survivors’ stories told through video interview clips, memoir excerpts, photographs and artifacts. Of the nearly forty survivors featured on Re:Collection, several were prisoners at Auschwitz. This human-centred learning helps students approach the history of the Holocaust in the most effective way. Personal accounts, when carefully grounded in their specific contexts, enable students to recognize the multiplicity of stories that make up this historical event. Students form connections with survivors when they learn about the ordinary lives they lived that were disrupted by war and genocide. And when students study the impact of the Holocaust on individuals, they develop historical empathy by understanding how people navigated their way through an unprecedented historical situation. Read more about our Educational Philosophy. The pedagogical goals of this activity are to gain knowledge of and to reflect on the lived experiences of prisoners at one of the most significant sites during the Holocaust. Survivor accounts of Auschwitz include discussion of immense suffering and death, so we ask teachers to take into consideration the maturity of their students and recommend this activity for students ages 15 and up. Auschwitz was a Nazi concentration camp complex built between 1940 and 1942 in German-occupied Poland. The largest camp complex established by the Nazis, Auschwitz contained three main camps: Auschwitz I, a concentration camp; Auschwitz II (Birkenau), a death camp that used gas chambers to commit mass murder; and Auschwitz III (Monowitz), which provided slave labour for an industrial complex. In 1942, the Nazis began to deport Jews from almost every country in Europe to Auschwitz, where they were selected for slave labour or for death in the gas chambers. In mid-January 1945, close to 60,000 inmates were sent on a death march to other Nazi camps away from the advancing Allied armies, leaving behind only a few thousand inmates too weak to travel, who were liberated by the Soviet army on January 27, 1945. It is estimated that 1.1 million people were murdered in Auschwitz, approximately 90 per cent of whom were Jewish; other victims included Polish prisoners, Roma and Soviet prisoners of war. We believe that taking this human-centred approach to learning about Auschwitz will stimulate your students’ interest in learning more about the Holocaust. Purpose and learning outcome: This inquiry-based activity encourages students to participate in knowledge-gathering by providing guided research questions that span the range of common experiences at Auschwitz: deportation, arrival and selection, daily life, resistance, and death marches. In small groups, students will research different questions related to this topic and then present their findings to the class. As part of a collaborative learning process, each group will contribute an essential piece of knowledge, so that the class as a whole develops a fuller picture of this complicated site. Your students will learn about the diversity of lived experiences at Auschwitz from a group of men and women, some of whom were quite young at the time, who arrived at Auschwitz from Poland, Czechoslovakia and Hungary. Required resources: Each group will need access to an internet-enabled computer or tablet, and the classroom will need to be equipped with a screen. Length of time: Approximately one class period. Introduce your students to Auschwitz by playing this short video from the United States Holocaust Memorial Museum. Divide students into five groups and assign each group a research question and a related list of recollections to view. Play the Re:Collection instructional video for students. 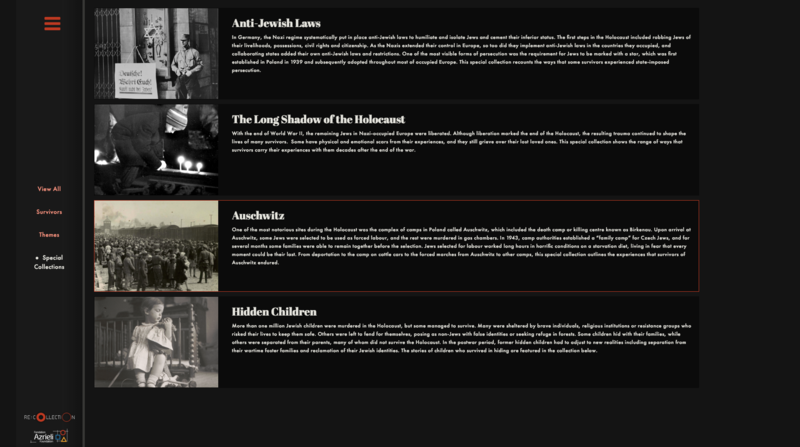 Allow students time to explore Re:Collection with the instruction to watch the short introduction to the Holocaust video on the menu,and to locate the Auschwitz Special Collection. All of the recollections students need to view can be found within the Auschwitz Special Collection. When all groups are finished, ask each group to explain their answer to the research question they were given. Groups should introduce one of the survivors they encountered and present one of that survivor’s recollections as evidence for their answer. Group 1. Research question: What did people experience immediately before and during deportation to Auschwitz? View these recollections: John Freund, “Train to Auschwitz”; Anna Molnár Hegedüs, “Deportation”; and one more recollection of your choosing that you find by exploring the Auschwitz Special Collection. Hint: as you view these recollections, consider how people experienced the physical, mental and emotional effects of these journeys to an unknown destination. Group 2. Research question: What happened upon arrival at Auschwitz? View these recollections: Nate Leipciger, “Selection”; Helena Jockel, “The Selection”; and one more recollection of your choosing that you find by exploring the Auschwitz Special Collection. Hint: as you view these recollections, consider how age affected how people made sense of what was happening to them and their families at this strange new location. Group 3. Research question: What were the living conditions like in Auschwitz? View these recollections: Nate Leipciger, “The Rules of Auschwitz”; Helena Jockel, “Living Conditions at Auschwitz”; and one more recollection of your choosing that you find by exploring the Auschwitz Special Collection. Hint: as you view these recollections, consider how the living conditions in Auschwitz were designed to dehumanize the prisoners. Group 4. Research question: In what ways did Jewish prisoners try to resist the cruel conditions they faced in Auschwitz? View these recollections: Felix Opatowski, “Uprising”; Helena Jockel, “Resistance in the Women’s Camp”; and one more recollection of your choosing that you find by exploring the Auschwitz Special Collection. Hint: as you view these recollections, consider how risky it was for prisoners to engage in resistance activities in Auschwitz. Group 5. Research question: What is a death march? Why did the Nazis force prisoners on death marches and what were the conditions prisoners faced during this phase of the Holocaust? View these recollections: Anna Molnár Hegedüs, “Death March”; John Freund, “Death March”; and one more recollection of your choosing that you find by exploring the Auschwitz Special Collection. Hint: Find the definition of “death march” in the glossary by clicking More Info. As you view these recollections, consider how this final phase of the Holocaust compared to imprisonment in Auschwitz. • Assign one or more of our memoirs to your class. See a complete list here, and feel free to contact us for suggestions based on the age and needs of your students. Our books are free of charge for teachers and students, and available in French and English. • For a more in-depth engagement with Holocaust history, implement our six-lesson unit of study on Hidden Children, Identity and the Holocaust. • Investigate whether there is a local Holocaust education centre in your province. 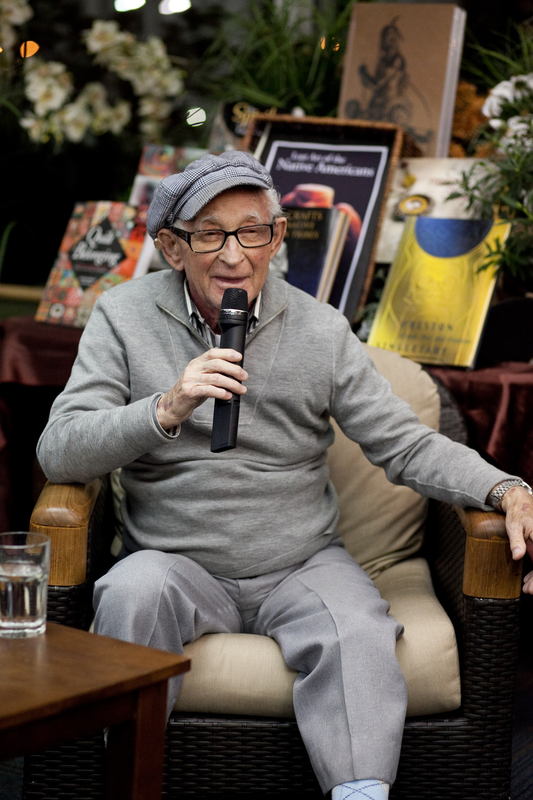 • Contact us to arrange a Professional Development session for teachers in your city to learn more strategies for bringing personal accounts from Canadian Holocaust survivors into your classroom. We’d love to hear from you. Get in touch to let us know how your students responded to Re:Collection and what you’d like to see from us in the future.